Higher rates of insomnia were reported among enlisted soldiers than officers, and there were higher incidences of nightmares among combat veterans compared to veterans who had not engaged in combat. Many of the respondents reported fatigue, tiredness or excessive sleepiness during the day. These findings did not surprised Dan Frank, a Navy veteran and CEO of VetAdvisor, an organization that offers free professional and wellness coaching services to veterans. VetAdvisor coaches frequently hear complaints of poor sleep and have found that poor sleep quality among veterans is oftentimes an indicator of underlying issues they are reluctant to discuss, such as financial issues, unemployment or post-traumatic stress disorder. 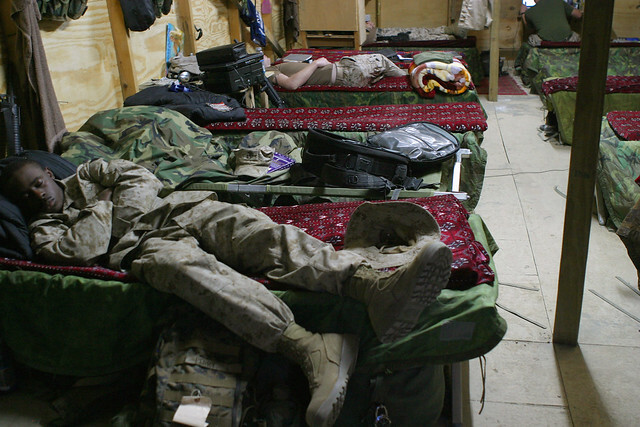 Veterans also are less likely to readily seek professional help for their sleep problems, according to the survey. Twenty-eight percent of the respondents had not discussed their sleep problems with a healthcare provider. Dislike of going to doctors, fear of taking sleep medications, fear of unsuccessful treatment and fear of being labeled were noted as reasons why the veterans put off seeking help. Untreated sleep disorders can increase the risk of cardiac disease, diabetes, high blood pressure and stroke. Medication shouldn’t be considered as the first course of treatment, according to physicians at the John D. Dingell Veteran’s Administration Medical Center’s Sleep Wake Disorders Center in Detroit. Doctors at the center first attempt to find the underlying cause of a patient’s sleep problem. Treatment may involve cognitive behavioral therapy (CBT) for patients with insomnia or an overnight breathing aid known as continuous positive airway pressure (CPAP) for patients with sleep apnea.